Mike from California asked about plumbing a compressor tank. What is the preferred or recommended practice to plumb in a second reciprocating compressor? Mike goes on to say – I currently have a piston type compressor with a 60 gallon storage tank. As my shop has grown, we have added additional equipment and depend upon pneumatics more often. I have already addressed all air leaks, but my current compressor runs on/off more frequently than I prefer (slightly undersized now). I also have no backup compressor and would be seriously penalized if the main compressor went down, so I just purchased another compressor with a 60 gallon tank. To start, I plan on only running one at a time, alternating between them on a weekly basis, but would like to be able to use the OFF compressors storage tank to lengthen the ON-motor-rest-time intervals.I was thinking that I would replace the existing fitting between the plant air system and existing compressor with a tee. I would then attach both tank outputs to this tee. Is this OK? Mike…thanks for your question. Having the receiver on compressor #2 add compressed air capacity to your plant mains should be OK. Here are my thoughts about plumbing a tank. Consider setting the cut in point on compressor #1 at around 5 PSI higher than the lowest PSI level your plant needs to operate. Set the cut in point on compressor #2 at the lowest acceptable plant working pressure, that being around 5 PSI below the cut in pressure of compressor #1. 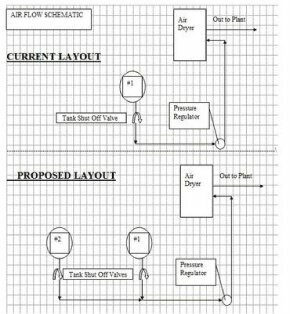 As long as compressor #1 can keep up with the plant compressed air demand, #2 will not cut in, yet the compressed air in the reservoir on #2 will be accessible to the system. When demand outstrips the capacity of #1 and the overall system pressure ultimately falls below the cut in pressure of #1 then it will eventually reach the cut in pressure in air compressor #2, and it will come on line too, providing added capacity. Change the set points of the two compressors as often as desired to alternate primary compressors. Your schematic does not indicate it, but I expect that you have got a general purpose filter between #1 and the regulator? When you add compressor #2, do not put a filter between it and the tee off #1. If you put an air filter between #2 and #1, you will, from time to time, get backflow from #1 to #2, not a good result. Make sure that you drain the reservoirs on both compressors regularly (daily). In fact, I wouldd put an auto drain on both just to be sure. I recently posted a question concerning the proper, or industry standard method to plumb in a second compressor. The only response I got, confirmed my plan and I am now writing with an update of my results. As my shop has grown, the old compressor (a 3.0 HP reciprocating compressor with a 60 gal. storage tank)was running at a 60% duty cycle. (I use OEM synthetic oil and change it out religiously at 1000 hrs (that is 1/2 the OEM recommended time). The first thing that I did was to conduct a compressed air system leak survey. Identifying and correcting approx. 30-35 leaks, I lowered my duty cycle to 19%!!! This resulted in increasing my compressors life-cycle time and much lower electricity costs. :)=$$$ for more toys, erh, TOOLS. ALL OF MY TOOLS AND MACHINES HAVE FRL’s. By regulating the tank to system pressure, my Duty Cycle lowered another 10%. I considered adding a second tank to reduce the amount of time that the compressor ran and then rested (duty cycle). When we brought an old tool out of storage (a double acting, self advancing pneumatic drill), the compressor could not keep up. (The compressor made 10.5 CFM @ 90 PSI and the tool “hogged” 20 CFM @ 90 PSI). I purchased a larger compressor (5.0 HP, 18.0 CFM @ 90 PSI, w/ a 60 gal tank) and plumbed it into my original system (I also posted a diagram). Yes, I upgraded my SYSTEM regulator to a HEAVY DUTY unit, and added an ‘upstream’, HEAVY DUTY filter that I drain daily (as well as both tanks). Without the “air hog drill” running, either compressor will fill both tanks, and run the entire shop. The little compressor’s DUTY CYCLE is now even lower (I have yet to make formal calculations). I alternate usage between the two compressors on a weekly basis. When I need the “hog” I turn power on to both my compressors. I had to order an adjustable pressure differential switch to get the little compressor to “kick in” and “assist” the larger compressor at the correct time ($90 and 1 hr of time). Everything is working beautifully. (There are some high pitched noises coming from within the tanks as the huge volume of air is sucked out by the ‘hog’, but everything seems fine). I am currently planning on installing an air flow meter between the system inlet and air dryer outlet(to gain knowledge and to justify the moment when my shop needs a screw compressor, to identify leaks (checked during off hours) or equipment problems (sudden increase in air flow, or decrease resulting if the air dryer became restricted). Thanks for your help. I would appreciate any comments or suggestions to improve.